Could schools of robot jellyfish soon be patrolling the world’s oceans, monitoring fragile environments such as coral reefs? That’s the dream of U.S. researchers, comprising of scientists from Florida Atlantic University and the U.S. Office of Naval Research. 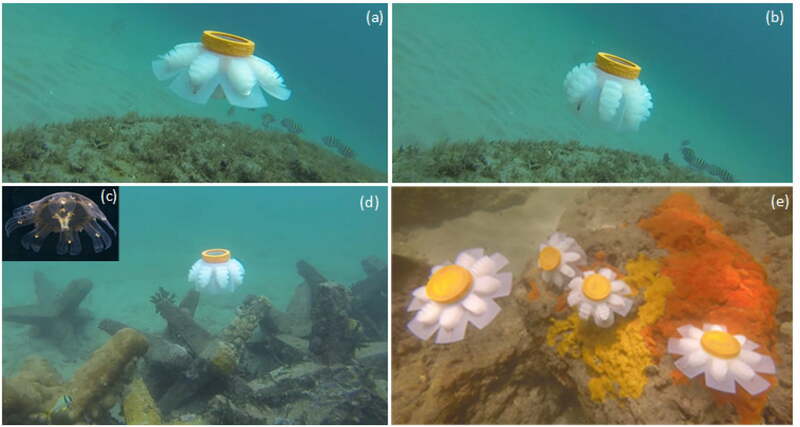 They have developed a nature-inspired soft underwater robot, capable of some impressive underwater locomotion — including movement from side to side and swimming through small openings, all with the distinctive “jet propulsion” movement we instantly associate with jellyfish. Jellyfish are highly impressive when it comes to moving through the water. Their propulsive ability is thanks to their body shape, which produces a combination of jet propulsion, vortex, rowing, and suction-based locomotion. To mimic aspects of this movement, the researchers building the jellyfish robot used two impeller pumps which draw in and push water to hydraulically drive the robot in the desired direction. One thing that makes the robot design so innovative is its simplicity. It requires no valves to work, which reduces space requirements and cost. To date, the team has 3D printed five of the jellyfish bots while using silicon for its actuators. At present, the project is still in its relative infancy. In the future, however, the team hopes to further develop the robot by adding features such as environmental sensors such as sonar, as well as a navigational algorithm that lets it determine whether it can fit through certain gaps. A paper describing the work was recently published in the journal Bioinspiration and Biomimetics.